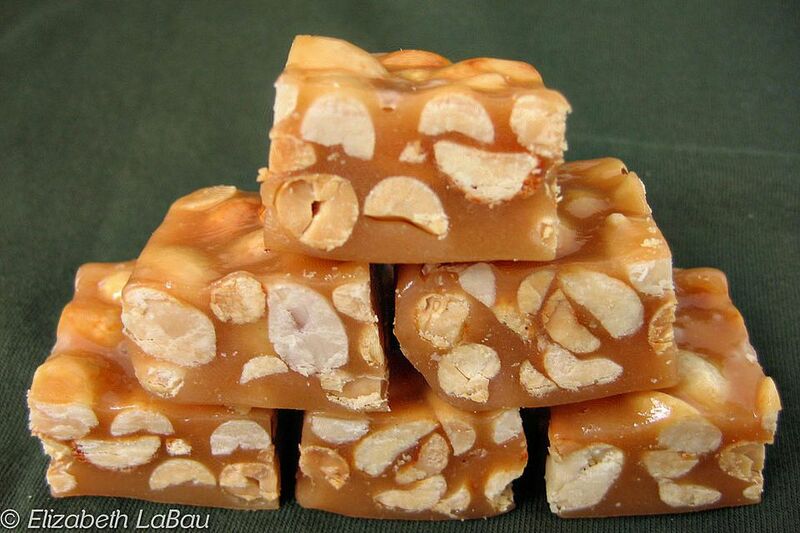 This Peanut Caramel recipe features a sweet, chewy caramel packed with salty, crunchy peanuts. These are great on their own, but my favorite way to enjoy them is to dip them in chocolate and sprinkle a bit of salt on top. They taste just like candy bars that way! 2. Combine the corn syrup, cream, milk, sugar, and salt in a medium saucepan over medium heat. Stir continuously until the sugar is melted and the mixture is smooth. Wash down the sides of the pan with a wet pastry brush to prevent sugar crystals from forming. 3. Insert a candy thermometer and bring the candy to a boil. Stirring occasionally, cook the caramel to 240 degrees (soft-ball stage). 4. Once the candy has reached the proper temperature, remove it from the heat and immediately stir in the peanuts. Pour the candy into the prepared pan and smooth it into an even layer. 5. Allow the mixture to set for at least 4 hours, or overnight. Once the caramel has set, cut it into small squares to serve. To store caramels, wrap them individually in waxed paper or cellophane and store in an airtight container in the refrigerator or at cool room temperature. Caramels can be kept for several weeks.